The game of hockey for Larry Bumstead has always been about a healthy balance between athletics and life lessons off the ice. For Bumstead, Head Coach of the CSSHL’s Female Prep Division’s St. Mary’s Flames, nowhere is that better exemplified by such tangible off-ice examples as the team’s second annual “Flames in the Kitchen” event. The brainchild of Bumstead, he approached his coaches, Jason Panteluk and Rob Friesen, along with team manager, Dave Chell, to get things rolling. It was designed from the outset to be an opportunity simply for the team’s players to give “something back” to their parents, families, close friends and mentors along the way. This year’s event took place on Saturday, February 10, 2018 at the Bell MTS Iceplex’s Press Box restaurant out in west Winnipeg as Red Seal Chef Leonard Church and his staff saw their beloved kitchen being safely 'overcome' by Flames (18 young ladies willing and able to help out and learn at the same time!) The event has grown as word-of-mouth has spread and those involved cite Bumstead’s original vision of making this event all about “giving back” as being what makes this event so unique. Players, too, have enthusiastically embraced the concept, happily taking on various service roles. Some 40 plus guests attended this year’s second annual event and comments ranging from “superb” to “schmeckt sehr gut” were common place as all invited enjoyed not only the meal itself but equally the spirit of thanksgiving in which it was being delivered. A huge thank you to supporters was also given by the team captains as everyone was enjoying their meals. 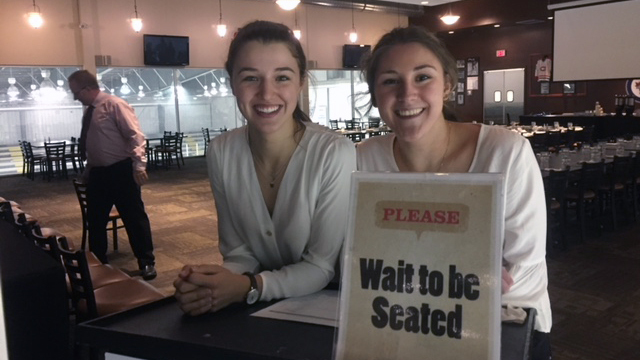 Other active participants at this year's event included soon-to-be-graduating Flames team captain Ashley McFadden as hostess and three-year graduating blueliner Ashleigh Jeannotte, grade 10 rookie Aimee Patrick and grade 11 veteran Seren Jocelyn as servers. The entire team played a role behind the scenes, helping out with numerous tasks that included coming to the kitchen the day before to help set up and pre-prepping of the various food items as required. All in all, it was a great experience for everyone involved and, for once, a very happy situation that involved having real "Flames" in the kitchen!